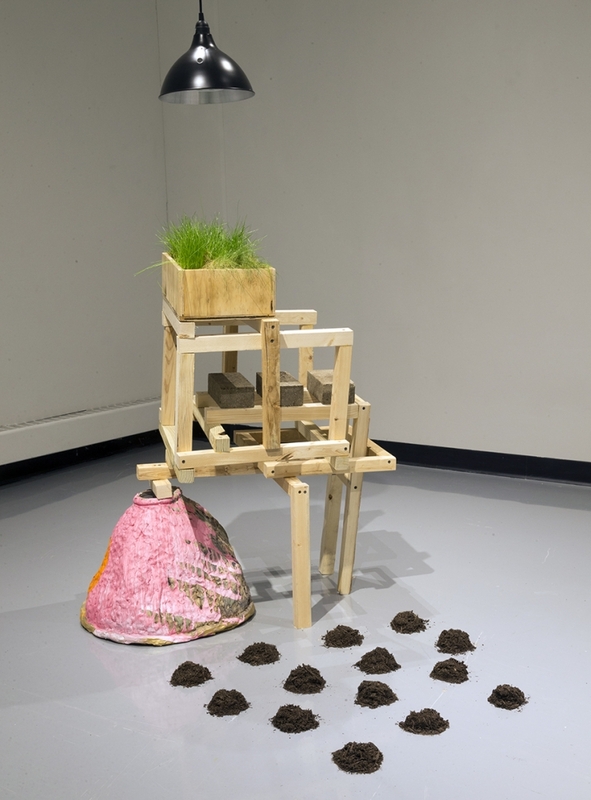 Tracy Featherstone’s solo exhibition, Fantastical Landscape, includes mixed media sculpture, live plant elements, and simple geometric shapes that explore the concept of art in South Asian culture. A recent trip to Asia (China, India and Nepal) provoked Featherstone to reconsider the popular western idea of “interactive art”. South Asian works of art are placed in the midst of everyday life and meant to be viewed, touched, and contemplated on a routine basis. People bring flowers and colored powder to the sculptures in midst of their daily commute and use paintings as a focus for their meditative practice. The works of art are a symbol of democracy in the way that every citizen that passes is welcome to interact and touch. The art embodies meaning, devotion, and function. Fantastical Landscape references the forms and interactivity of Tantric paintings, stupa mounds, shrines, and representations of deities. The exhibition functions as a site of exchange where the role and cultural positioning of art is examined. This exhibition was made possible with generous support from the Office of Research and Scholarship at Miami University.